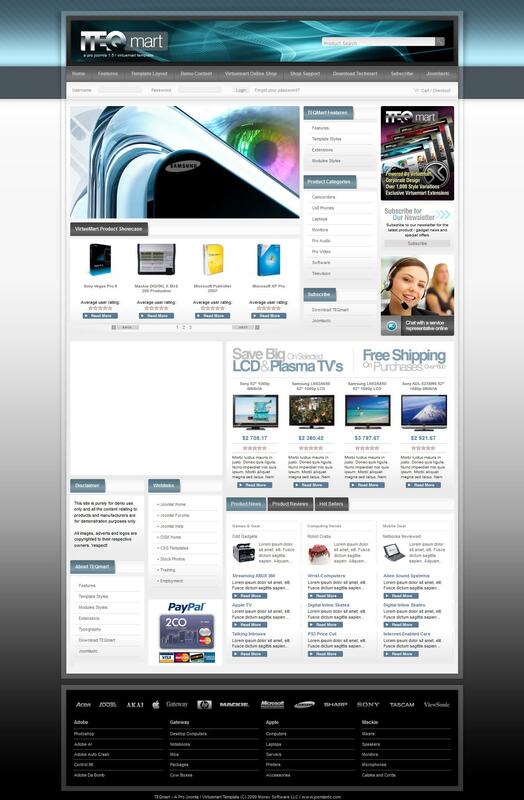 JXTC Teqmart - a wonderful online store template for Joomla 1.5. This pattern as XTC Teqmart perfect for creating an online store. Also XTC Teqmart template has the ability to accommodate a variety of additional modules. Design template XTC Teqmart FULL made in a standard three column scheme, thanks to perfectly matched colors in the design, it is much more pleasant to the eye of the user than most similar frameworks. Besides template JXTC Teqmart there and distinguishing feature - its upper part contains a field where you can enter the name of your website (the company). These simple actions over XTC Teqmart, already can transform the look of a few of the site and make it fit your requirements. Template XTC Teqmart installed on sites running Joomla 1.5.